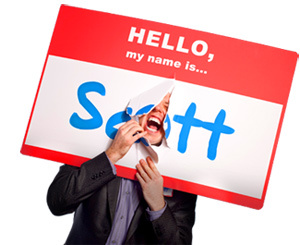 19 Ways to be the ONE Person at Your Next Conference Everybody Remembers - HELLO, my name is Scott! 1. Attitude. In a sea of thousands of people all trying to get noticed, you have NO choice but to be unforgettable and remarkable. So you better begin with the attitude of approachability. That you’re going to stick yourself out there. 2. Detach from outcomes. Sure, you have goals. Maybe to sell. Maybe to get in front of the right buyers. However, also try to focus less on the outcome and more on the big picture. Free yourself from agendas. Develop a no-entitlement attitude. And focus on having fun, delivering value and creating a memorable (er, unforgettable) presence. 5. Smile. The whole damn time. 6. Wave. To every single person. 8. Practice strategic serendipity. Say yes a LOT more. Spend time with people in areas and around things you wouldn’t normally approach. Break your patterns. 9. Don’t pick and choose. Talk to everybody. Even your non-buyers and customers. Even the food service people. Even the janitors. Even the information booth guy. Even the conference planners. Especially the conference planners. Because you never know. And consistency is far better than rare moments of greatness. 10. Dress it up. If you can find some sort of costume that’s consistent with your brand, do it. 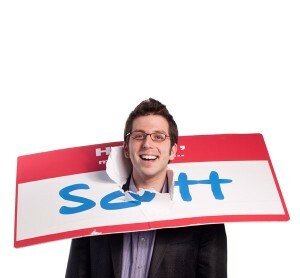 I wear a giant nametag to my conferences. Nobody misses me. Does your appearance stand out or blend in? 13. Strike the match. Do something that make people say, ‘Dude, did you see that guy who…’ Generate inner-conference buzz. 14. Make music, not noise. Everyone else at your conference is going to be making NOISE. With their annoying, boring promo materials and free toys that nobody wants or cares about. You need to make MUSIC by getting people to smile, laugh, say hello, start talking, have fun and deliver remarkable value. 15. Interact; don’t interrupt. Everyone else at your conference is going to be INTERRUPTING the other attendees. Take this! See this! Have a free cookie! They say. Instead, consider INTERACTING, not interrupting people. Making friends. Strike up conversations. Talk about business later. Lead with your person; follow with your profession. Open your conversations with topics OTHER than business, sales, the weather, traffic and the like. 16. Just chill. Stressed and hurried are not approachable adjectives. Separate yourself from other attendees by not appearing overly needy and desperate for business. After all, it’s hard to sell with your tongue hanging out! Just chill. Relax. a. Smile and point at you. f.	Tell everyone about you. a. Are you worth videotaping? b. Are you worth taking a picture of? c.	Are you worth blogging about the next morning? 19. Be a rock star. Do things to enhance your celebrity status. Bring a friend to follow YOU around with a camera all day. Give a speech. Hold a pre or post event party. How do YOU stick yourself out there at conferences?